From the Hancock County Courthouse, go southwest on Hwy 22 for 7.2 miles to the intersection of Hwy 22 and Main Street in Devereux. Turn right (at the backward fork) onto Main Street and go 0.2 mile until it dead ends into Jones Chapel Road. Turn left and follow Devereux / Jones Chapel Road for 4.9 miles to Carr Station Road. Turn right onto Carr Station Rd and go for 8.6 miles to Lake Sinclair Drive. Turn right and go 3.9 miles to Island Creek Dr. Turn left and go 0.1 mile. Turn left on Horseshoe Drive and go approximately 200 feet. Walk to your right approximately 200 feet into the woods. w/o W. H. Bost. 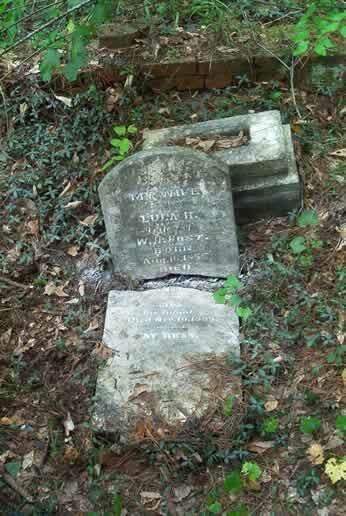 "My wife"
"Also her infant" on piece of headstone broken off Lula R. Bost's headstone. 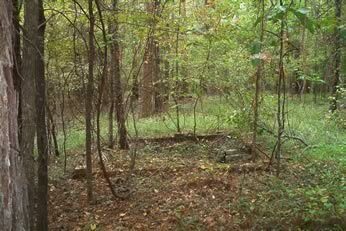 Evidence of one other grave within the outline of bricks around Bost graves. Also evidence of many other graves outside bricks.